Au cours des différents salons, nous finissons par rencontrer les mêmes personnes de l’industrie et avec certaines d’entres elles il nous arrive de tisser peu à peu des liens. Lors de la visite de Monsieur Gary Leonard Koe, manager de Genesis dans nos locaux de Québec lors de la présentation des enceintes Genesis 5.3 et des amplificateurs GR360, nous avons eu l’opportunité d’écouter un disque de chez Faber Acoustical et d’évoquer quelques grands noms de la musique ainsi que des manufactures qui ont contribué à faire que la hifi d’aujourd’hui est en pleine forme et s’épanouie au travers de nouvelles créations, toujours plus innovantes. Si je vous dit BAT, cela ne va peut être pas vous dire grand chose, en revanche si j’ajoute Balanced Audio Technology, il se peut que vous sachiez de quoi je parle. Si je vous dis Faber Acoustical, qu’est ce que cela évoque pour vous? Afin de limiter le suspens, je vais partager avec vous une conversation intéressante avec deux personnages qui ont marqué et qui continuent à le faire, le monde de la musique ainsi que celui de la reproduction musicale en haute fidélité. Tout ça pour amener le sujet : un disque et deux passionnés dans l’âme. George et Geoff, au delà d’être des légendes vivantes, perpétuent une tradition, celle du travail bien fait et de l’amour de leur métier; bien au delà de l’aspect purement mercantile, même si nous devons tenir compte du seuil de rentabilité, la preuve est faite que l’on peut tout à la fois être un bon manager et un artiste créatif. Vous apprendrez dans quelle condition le disque Faber “Blues” a été réalisé, cela devrait vous plaire, car dans le genre artisans passionnés, ils se posent là. 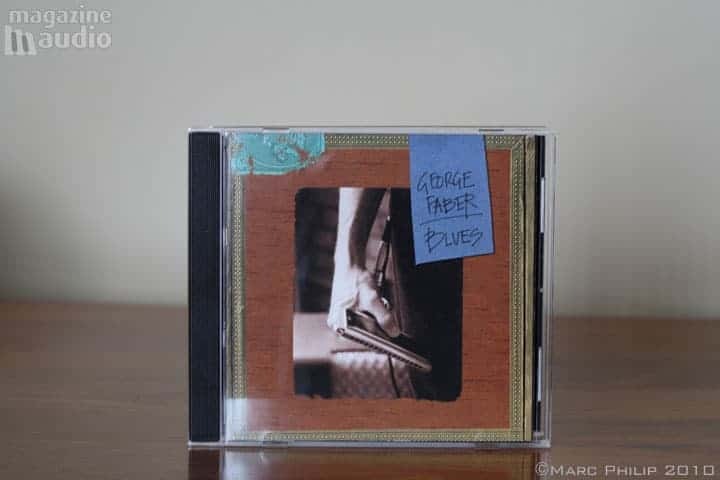 À la fin de cette entrevue, je vous présenterai plus en détail mon “coup de cœur” avec le disque de George Faber : “Blues”, une petite merveille à consommer sans modération, car réalisé avec le plus grand soin, sous l’égide du concept : “Less is more”. Here are some answers from George and me to your questions. Marc – Who is behind George Faber acoustical company? Geoff’s : “BAT Records is a partnership of George and myself. George: “I’ve been a singer/songwriter/performer for as long as I can remember. Born in Urbana, IL, I grew up close enough to Chicago to make my way there at a young age, and became deeply rooted in the Chicago blues scene. When I was about 19, I rented a room above a bar on Lincoln Ave., locked myself down for a few months, and did little else but listen to blues recordings and play along with my harmonica. While blues was in my blood, I started off my musical career as the front man in a controversial glam rock band called the Finchley Boys. We recorded an LP in the late 60’s called “Everlasting Tributes” (still a collector’s item – especially in Europe), and performed at rock festivals – complete with a pre-Alice Cooper boa constrictor. From there, my evolution of musical styles began. I spent years touring the country performing in blues clubs like Kingston Mines and Wise Fools Pub, playing with legends like Muddy Waters and Lowell George. We packed rooms from Chicago to New Orleans, and had a video in rotation on early MTV. My music has continued to evolve – blending all these styles, but blues remains at the core. Thanks to my partnership with my longtime friend (and on-and-off business manager and co-producer) Geoff Poor, “Faber Blues” was made – and ultimately ended up receiving a warm reception from the audiophile community. I continue to write songs, and have recorded several other albums. As a singer/songwriter, these records show a mellower side, with an acoustic soul music vibe. At the same time, I continue to perform live out of Minneapolis, my home for the last 20 years. Geoff: “George and I have been friends since we were young kids in the 60’s. With lots in common (athletics and a rejection of authority), music became a focal point for both of us by the time we were 14-15 years old when we both became lead singers in two local rock bands. I had been exposed to classical and jazz by my parents with my mother being a classically trained singer who also had sung popular music during the big band era. In fact, Sinatra and Fitzgerald were so familiar to me growing up, I thought that was how all singers were supposed to sound. But it was the Beatles and the Stones that turned me on to why “popular” music could and should be popular. I was hooked! I continued to sing while going to school, and, in fact, put myself through the University of Illinois by leading several rock bands. After graduating, I lived “out of a suitcase” for a bit while spending time in New York and Los Angeles. While working on a solo record in New York, I became disenchanted with the project, and quit. I went back to Illinois to attend law school, but got side-tracked promoting rock concerts and managing bands. One of the bands I managed was the second iteration of the Finchley Boys, whose front man was George Faber. George was the most charismatic, dynamic performer who was almost famous. I produced a Finchley demo record of two original songs, but, just when I’d sold Epic on a singles deal (with an album to follow), the band broke up! To say I was disappointed is a gross understatement. George and I worked on a few more projects, Jawbreaker being the most promising, but we drifted apart after awhile. I’d started a couple of hi-fi stores by the late 70’s, and this lead me to being one of the founders of Dunlavy Audio Labs in 1992. After leaving Dunlavy in the spring of 1995, I helped kick-start Balanced Audio Technology in 1995 where I’m one of three partners. Despite living 650 miles apart, George and I have remained close friends (he and Andrea are the god parents of my daughter, Kaitlyn). In 1997, George released “George Faber” – an album of original tunes he’d made with the help of some his friends. I was so knocked out that I called Gene Pope with the idea of re-mastering the record, and releasing it on Gene’s audiophile label, Pope Music. Gene loved the record also, and “It Beats Workin” (the title of the Pope version) was released at the Stereophile Show the next year. Several hundred CDs (I was told 500) were sold the first day of the show (in fact, Pope sold out), but this success was short-lived because Gene shut down the label a couple of weeks later as part of the fall-out from the break-up of his marriage. Once again, George was almost famous! I’d always wanted to do a live recording with George because he’s such a dynamo on stage, who is as good live as he is in the studio. This is especially true when he’s performing with great musicians (like the Peterson brothers who were on the “Blues” record). I’d witness this quality on a number of occasions in the 90’s when George was the featured “rocker” at Ruperts, a night club in Minneapolis that featured a great orchestra and several terrific vocalists of different styles. So, when we talked about a “live” record, we agreed a blues-based project made the most sense because it could be more spontaneous and feature real-time improvisation. The original plan was to record a couple of nights’ performances at the Fine Line in downtown Minneapolis, but the performing schedules of the musicians that George wanted on the record never coincided with the club’s schedule so we decided to do a “virtual” live project in a studio, cutting tracks when the guys’ schedules permitted. It really worked. What a line-up of talent!”. Marc – What’s the Faber philosophy and typical audio signature? Marc – Would it be possible to what’s the recording process and what type of electronics and microphones are used? George: “I sang through a Blue mic (with a Neumann diaphragm) and a Summit preamp. Geoff: “We cut the live tracks at A440 studio in Minneapolis with John Heinen engineering. The basic tracks were laid down on a 32 track Mitsubishi open-reel digital tape machine that sounded a lot better than other digital devices I’d listened to. We used a modified analog board (the brand name escapes me) and a variety of AKG, Sennheiser, Shure, and Audio Technica microphones in a large main room which accommodated all the players, except Scottie (acoustic piano) and George (vocals) who were in sound-proofed booths visually connected to the main room. This allowed visual communication amongst the whole band. We mixed the basics onto both digital (DAT) and 2-track analog, and used a pair of Dunlavy SC-1s to monitor with. Although the Dunlavys can’t play at ear-splitting levels, they are incredibly revealing and honest – perfect for hearing the truth. When I went to Bob’s (Katz) in Florida for the mastering, Bob and I agreed the analog mix was more faithful to the music – so, we used the analog mix. Katz is one of the world’s most respected recording and mastering engineers because, besides being a technical wizard, he’s got great ears and respects the music and the artists who make it. Marc – “Less is more” Can you tell me more about? Geoff: “The concept of ‘less is more’ is the basic philosophy we worked with on the “Blues” record. I have always been attracted to the great records made in the late 50’s and early 60’s because all of the orchestral recordings, most of the jazz records, and even most of the pop/rock records were made in “real-time” – with everyone playing together at the same time. What a concept! This was a far more dynamic way of making records because of the spontaneity, inspiration and “feel” that musicians experience while playing together. George: “This began to change in the mid-60’s with the advent of 4-track tape machines which allowed over-dubbing and ping-pong techniques. That’s what made the early Beatles’ harmonies so cool. With Sgt. Pepper and later recordings they dubbed harmonies more often than not. Geoff: “And singers sing with themselves with the help of digital pitch correction because they can’t always sing without the help to stay in tune. Very unnatural. Contrast that to how Sinatra felt while standing in the middle of the orchestra singing with all those terrific musicians, not to mention the inspiration felt by the various players accompanying Sinatra. “Faber Blues” brought together great musicians who all loved playing together. Geoff: “In the jazz genre, Miles’ “Kind of Blue” and Sinatra’s “Sings For Only The Lonely” are great records. I wore out my Dad’s copy of “Kind Of Blue” when I was in grade school, and I still listen to it regularly. Sinatra’s rendition of “What’s New” (on “.. Only The Lonely”) is a masterpiece, really amazing. Marc – do you have a preference on the recording material you use? Marc – Do you listen to other music than yours? Geoff: “I listen constantly. In fact, I listen to all types of music on a daily basis as part of my work. Marc – How do you feel about the CD market? Geoff: “ CD sales are declining, while hi-rez digital (in various formats) is becoming more important all the time. What I love is the fact that LP sales are on the rise. Marc – What are your visions in the future about CD? Marc – Who are your listeners and customers? Geoff: “We have sold ‘Faber Blues’ primarily through audiophile-type distribution. A number of Balanced Audio Technology specialty dealers have sold hundreds of the CDs without any real promotional effort on our part. Of course, I’ve used the CD for demonstration at audio shows, such as CES, Festival du Son, Rocky Mountain Audio Festival, etc.. People who hear it want to buy it. We’ve sold thousands of copies with no real effort. Marc – Any dreams still to be realized? La conception d’un disque ne se limite pas à quelques accords et une voix sur un média, il s’agit de bien plus que ça. On parle de spontanéité, de l’expression de l’être intellectuellement vivant, émotionnellement connecté, qui pour une raison qui lui est propre, décide de l’exprimer en chanson, le Blues étant le véhicule le plus adapté pour soulager l’âme et le cœur des femmes et des hommes qui ont du vécu. Sur le plan technique, il n’y a rien à dire, c’est impeccable, George et Geoff s’en sont largement expliqués, il fallait que ça sonne juste, authentique et c’est le cas, tout en étant cohérent face à leur concept du “Less is more”, moins il y a d’étape entre l’interprétation et le mastering, mieux on se porte, la place est faite à l’improvisation, pas ou peu de préparation, c’est spontané et ça s’entend. Bob Katz s’est chargé du master au Studio A440 et c’est George Faber et Geoof Poor qui ont produit le disque en 2002. Pour les amateurs purs et durs de musique Blues, ce disque est un incontournable, si vous parvenez à vous le procurer, car il semble difficile à trouver, j’ai attendu plusieurs mois avant de recevoir mon exemplaire. Le feeling qui se dégage de cet enregistrement est absolument formidable, ça respire l’authenticité, la générosité, le plaisir de jouer entres copains et d’interpréter de la musique, je n’ai rien d’autre à ajouter que de vous inviter à en faire l’écoute. Attention toutefois, le titre laisse clairement entendre qu’il s’agit de Blues, mais certaines chansons sortent quelque peu de ce cadre pour évoluer du côté rock/folk. N°12 : Why I Sing The Blues. “Because when I play this music, everything seems right”. Une autre référence de blues vient de faire son entrée dans ma collection, moi aussi quand j’écoute du bon Blues, j’ai le sentiment que tout va bien, alors même que les échos du monde prétendent le contraire.